Ministry Issues Strict Advisory To TV Channels Showing Astrology, Vastu & Religious Content! Indian Ministry of Information and Broadcasting has issued a strict advisory to number of TV channels telecasting programmes that encourage superstition and blind belief. According to the Advisory, many TV channels beam (so called) religious content and discourses from self-proclaimed Babas and Gurus who promote services and products that mislead the consumers. The ministry has also taken strong objection to the fact that the programmes by Gurus and self-proclaimed healers are being shown for hours together are actually advertisements but are shown in a way leads viewers to believe they are watching normal unbiased programmes. This completely violates the advertising code contained in Cable Television Networks Rules, 1994. What is quite interesting is, apart from wholly dedicated channels like Aastha TV, Sadhna TV, Zee Jagran and Bhakti TV, even many news channel have been beaming content related to Vastu and Astrology. These programmes are more often than not are sort of advertorials where TV viewers can ask questions to these Gurus and get remedies to their various problems. Under the garb of providing solutions to the problem, they are actually advertising their products and services which a gullible consumer does not understand. “no advertisement shall contain references which are likely to lead the public to infer that the product advertised or any of its ingredients has some special or miraculous or super-natural property or quality, which is difficult of being proved”. 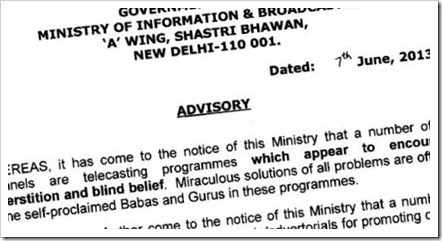 This is not the first time that Ministry has taken objection to such kind of content – On 13/05/2010, ministry had previously sent a similar advisory warning to TV channels restraining them from beaming content that promotes superstition and blind belief. ZEE TV telugu is telecasting OMKARAM PROGRAMME from 9-30 AM to 10-30 AM inspite of the fact that guruji is having bad histoty as per wesite in net. It is only for rating. Why cant the Government ban such programmes ? It is true that there are many Gurus, Vastu consultants and Astrologers who are deceiving by promising all kinds of “cures”. Govt. must do everything in it’s capacity to prevent such frauds and violation of codes etc. However, the Govt. itself has a bunch of bigots and biased people; Hence Govt. commands neither respect nor credibility. This is a case of wh’ever selling chastity belts. Not only channels beam Astrology and religion I feel disgusted with some channels beaming hours on some so called potency medicines. I have no objection to their marketing if they only show how it is made. But most of them show the “proof” as a selling point. A hizda looking man tells you stories of how he used to get rejected earlier and how many girls he laid (sorry for the language but thats how they beam the show) after starting to take the magic madicine. They portray women in bad light. They make women as trophies and tell public how many trophies you can win by taking their medicine. Disgusting stuff. Cant watch TV with family. I fail to understand the logic behind the statement ” where TV viewers can ask questions to these Gurus and get remedies to their various problems. How does the above statement apply only to gurus and palmists. There are many new channel which have similar Q&A for motor cars and bikes, isnt that actually an advertisement and cant the channel be silently promoting the brand which advertises with them? Secondly, there are channels which even show christian prayer meeting and healing session as well but surprisingly the GO mentions only Babas and Gurus and vaastu targetting hindus sentiments primarily and not mentioning anything about other religion.